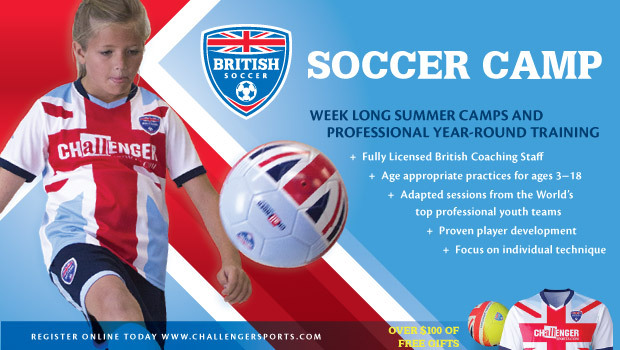 We are always looking for camps that offer great skills for the kids. Evan has been playing soccer since he was 3 and been playing on the travel team for four years so getting extra practice is always good. For the last three years he has been going to Challenger Sports camps. Two years ago he went to TetraBrazil Soccer Camp and loved it. Now for the last two years he has gone to British Soccer Camp. There is an option for half day or full day. I chose the full day option that went from 9 am to 4 pm. They did skills to start the day. Then did games and other fun things. They also had some theme days. As it was really hot on the last day they got to bring water guns and have fun.Evan's team is coached by parent volunteers. I wanted to make sure Evan got to learn from some experts.